The old vehicular track up the Black Bluff Range at Smiths Plain in north-western Tasmania is scoured down to the bedrock. In places the holes are so deep and slippery that it’s difficult to clamber up; in other places you are buffeted by the scrub over-reaching from both sides. The object of the climb, the Devonport Gold Mine, has lain idle for decades, but even though the road is now impassable for vehicles you can’t help but be impressed by the enterprise of the miners in establishing it. In making this climb on foot several years ago, I was reminded of Ron Smith’s account of the same journey more than a century earlier. Nowadays you drive to Smiths Plain and walk from there along forestry roads to the base of the bluff. Twenty-six-year-old Smith had no car. Early one morning in December 1907 he set out for Black Bluff from his home at Westwood, near Forth. A fourteen-kilogram swag was balanced on the front of his bicycle, camera (two kg) and field glasses were slung over his shoulders. Four hours after leaving home he decided to eat lunch—at 9.16 am, for all of six minutes!—near Blackwood Park at Nietta. Leaving his bicycle at a point two miles beyond Phillips’ house at South Nietta, and taking a second bite of lunch at 11.45 am, he started across the then mostly button-grass Smiths Plain. The plain took its name from it being his father’s point of entry to the high country. Prospector James ‘Philosopher’ Smith’s route over the Black Bluff Range and down to the Lea River had been his access to discoveries of gold, copper and manganese he had made in the area. Other prospectors had followed in his footsteps. 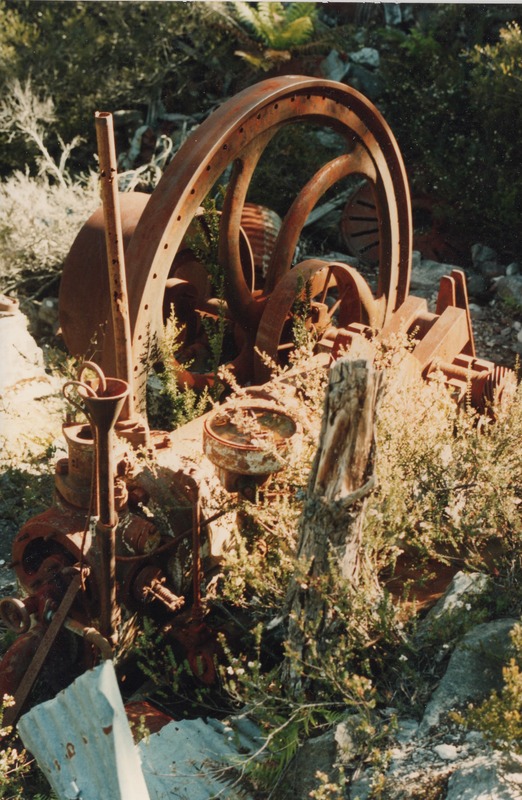 One was Alf Smith, an unrelated prospector who, like others, had worked on Philosopher Smith’s farm through the winters as part of the latter’s scheme to support mineral prospecting. Panning his way up Devonport Creek in 1902, Alf and his brother-in-law Reuben Richards found what they thought was a gold reef. Alf worked this mine and one at Copper Creek, Lea River, building tiny huts at both sites. No knapsacks? 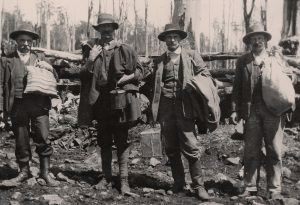 Alf Smith (left) and fellow miners preparing to climb the Black Bluff Range, 22 October 1909. All of them seem ill equipped for the long haul up and over the mountain. Ron Smith photo courtesy of the late Charles Smith. The foot track of a century ago climbed a spur of Mount Jacob through eucalypt forest, affording views of the Shepherd and Murphy Tin, Tungsten and Bismuth Mine and the All Nations Tin and Tungsten Mine near Moina. Like the present-day Devonport Gold Mine vehicular track, the foot track avoided the gorge formed by a creek running eastward from Tiger Plain towards the Iris River. Today the vehicular track has spread out like a delta on both sides of the creek, suggesting that over the years people have chosen different crossing points. One day I met a bearded old man coming down the hill to the stream crossing. His flowing hair and team of dogs made me wonder if he was the ghost of Philosopher Smith returning from a prospecting expedition. Philosopher’s son took the staked track which crossed the range to the Lea River. As it began to descend from its exposed highest point Smith diverted from it to the east, endeavouring to find the track to the Devonport Prospecting Association (DPA) Gold Mine, as it was then known. This is the opposite of today, when you take the right-hand fork, confirming that the vehicular track did not follow the line of the earlier walking track up the hill. The walking track went further to the west, closer to the edge of Golden Cliff Gorge, the great north-south rift through the Black Bluff Range caused by a fault line. ‘a fireplace at the east end, and a verandah on the north side, under which the door opened. Two bunks (single), one above the other, took up the west end and a double bunk half the north side … A window, one large sash, was in the south side’. The hut was well furnished, with table, stools and even cooking and eating utensils. Next day Smith visited the trig station on Black Bluff, travelling mostly by compass through the mist, and photographed the DPA adit and the blacksmith’s shop near it. It was a poor gold mine. Early assays approached a very respectable ounce per ton, but this was due to the sampling of surface enrichment that could not be expected to continue at depth. Examining both the irregular quartz vein cut in the adit and the gossan accessed in trenches, in 1913 Government Geologist William Harper (WH) Twelvetrees predicted only ‘negligible quantities of gold’ at depth, with the ore changing to iron sulphide. Subsequent geological reports and returns confirmed this, but the allure of gold kept men coming. 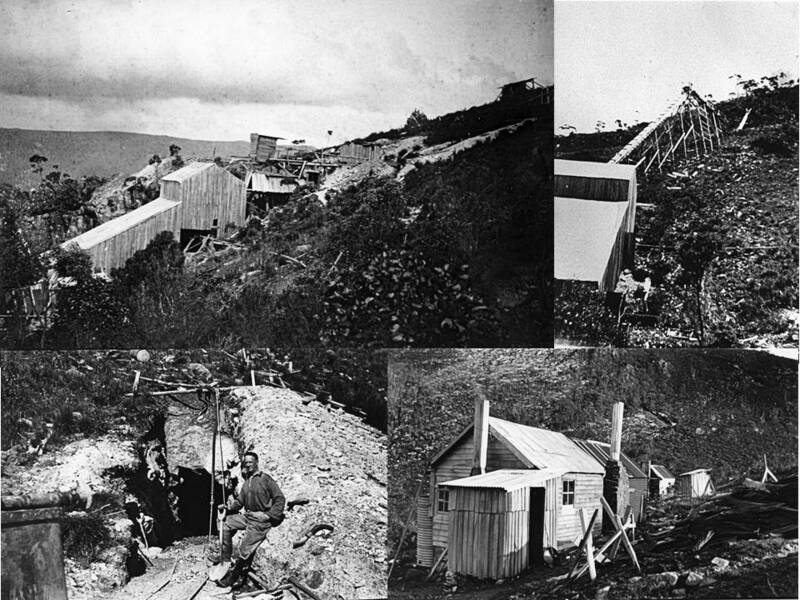 Alf Smith’s hut at the Devonport Prospecting Association (DPA) Mine, 1907. Depreciation of the British pound in 1931 gave the gold price a boost. In a repeat of the 1890s depression, diggers retried old gold shows, hoping to plunder a supposed reef that had failed to yield its treasure last time. 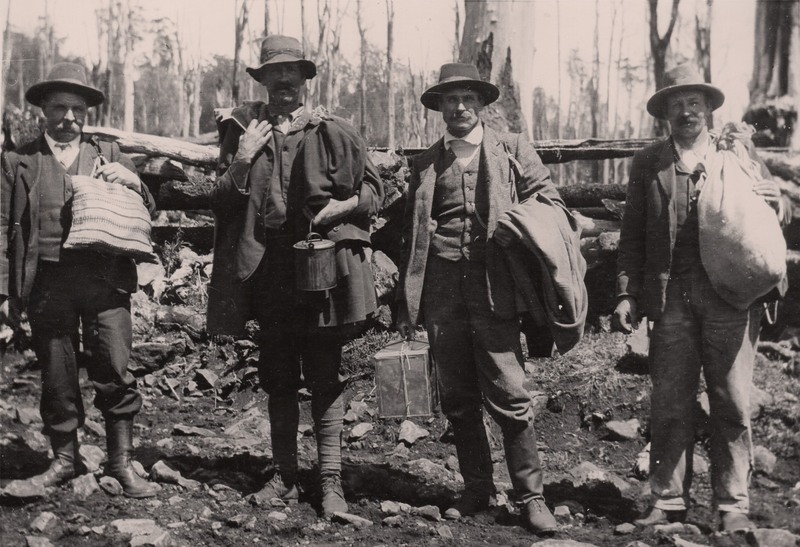 Hunting also drove men into the bush, with 1934 being a record season for ringtails. Cliff Beswick and Reg Ling were reworking Black’s Lea River Gold Mine when Bernard ‘Barney’ Fry walked off a nearby cliff while out possuming by acetylene light. Cashman’s Gold Mining Syndicate sank new shafts and extended one of the adits in search of the Lea River lode in 1940. 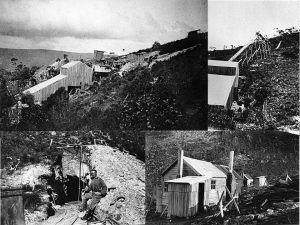 (Clockwise from top left) Probably 1950s photos of the gravity-fed mill; the trolley way from the adit to the mill; the entrance to the adit; and the huts, Devonport Gold Mine. Colin Dennison Collection, University of Tasmania Archives. The final abandonment of the mine left infrastructure to crumble high on the exposed spine of Black Bluff. Historian Dr Peter Bell’s examination of the overgrown, plundered site in 1995 revealed a technological morass, including a 1923 Crossley oil engine that was set up to power a treatment plant on the opposite side of Devonport Creek, a Forwood Down grinding pan, a 1920s–30s Lister oil engine, a steam winding engine and a late-nineteenth-century Cameron steam pump. The purpose of some of the gear was by then unfathomable. 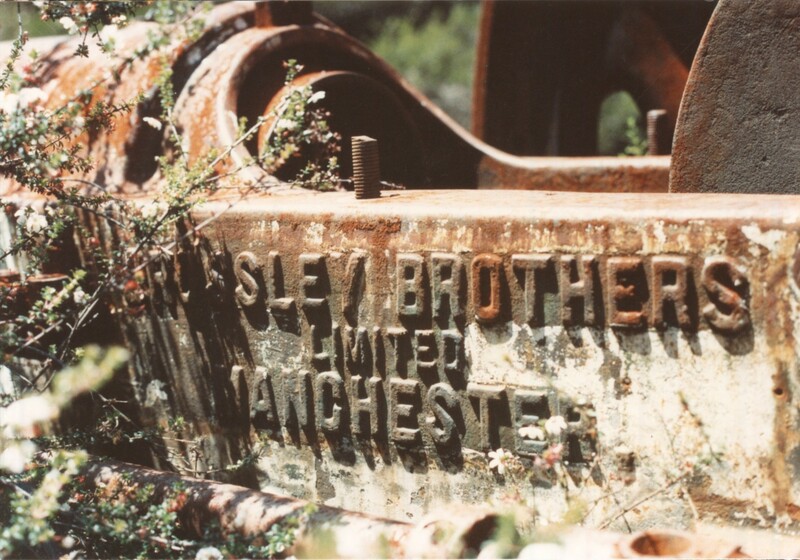 Crossley engine and flywheel, 1995. Nic Haygarth photos. Devonport Mine hut from the rear, looking towards Stormont and the Lea River valley. Nic Haygarth photo. The remains of what was probably the blacksmith’s shop; and the adventures of Chunder Loo, Devonport Gold Mine, 1995. Nic Haygarth photos. 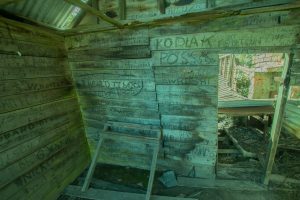 The two-room hut still stood, although the broken windows were covered up and the exterior boards appear to have been torn off and used for firewood, exposing the wall cavities to the elements. There was no recovery from here without urgent attention. 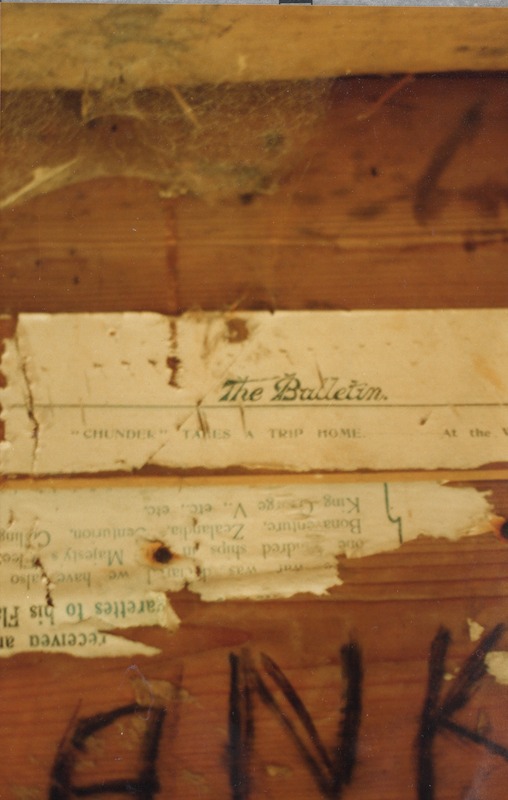 Inside the hut you could read the wallpaper—pages of Sydney magazine the Bulletin from 1915! (One of the pages featured ‘Chunder takes a trip home’, satirical verses by Ernest O’Ferrall, whose Sri Lankan character Chunder Loo originally appeared in newspaper advertisements for Cobra boot polish. O’Ferrall’s Adventures of Chunder Loo, illustrated by Lionel Lindsay, was later issued as a book, with verses appearing in the Bulletin.) 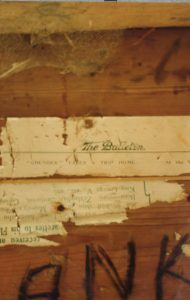 This aged wallpaper suggested that part of the hut, at least, dated from the first operation of the mine, possibly even incorporating elements of Alf Smith’s pencil pine hut. Going, going … almost gone. 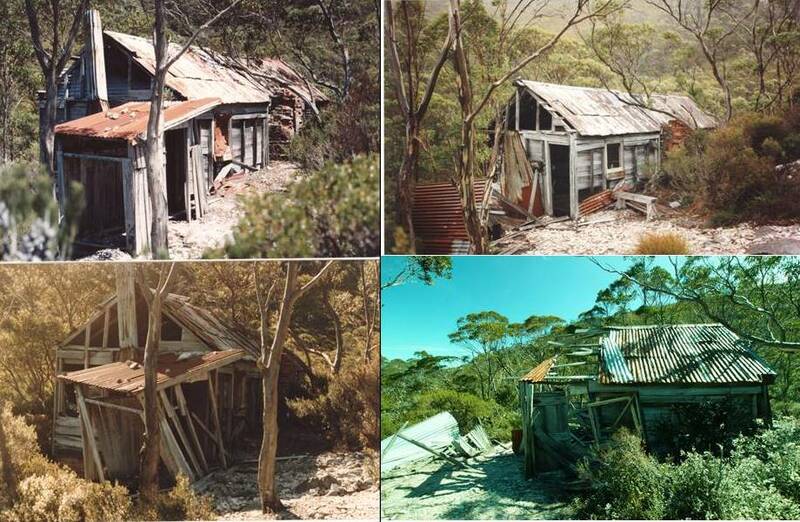 Devonport Mine hut time lapse 1995-c2015. Nic Haygarth photos. The vehicular track enabled the Crossley to be removed from the mine, reducing the site’s integrity but allowing restoration of the now rare engine at Pearn’s Steam World, Westbury. 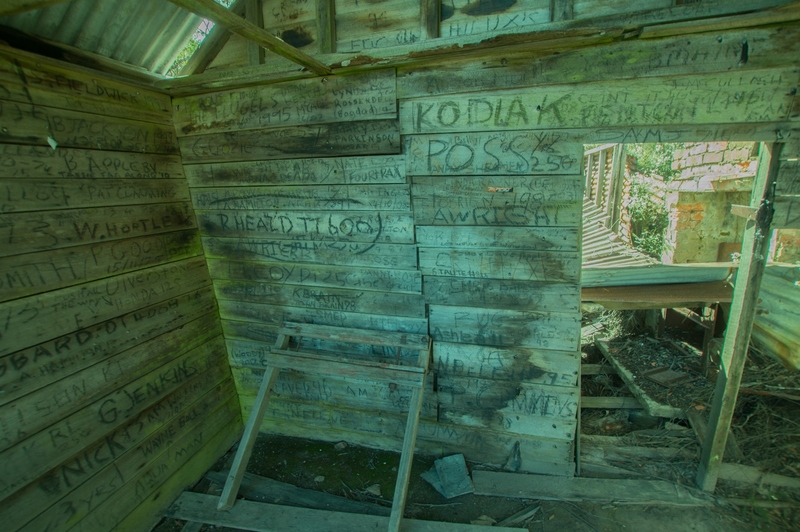 Since the exterior walls were removed, the two-room hut has declined rapidly, such that within a few years there will be no standing walls at the Devonport Mine. Rarely was gold fever more virulent than here, defying geological argument for most of a century. Ron Smith diary, 13 December 1907, NS234/16/1/4 (TAHO). Nic Haygarth, Baron Bischoff: Philosopher Smith and the birth of Tasmanian mining, the author, Perth, Tas, 2004, p.136. ‘A Barren Bluff find’, North Western Advocate and the Emu Bay Times, 19 February 1902, p.3. Ron Smith diary, 13 December 1907. Ron Smith diary, 14 December 1907. ‘Middlesex district’, North West Post, 5 March 1914, p.4. See, for example, QJ Henderson, ‘Departmental report on the Devonport Mine, Black Bluff’, Unpublished reports, 1939, pp.61–64. ‘In darkness: stumbled over cliff: hunter’s death’, Examiner, 5 June 1934, p.7. ‘Gold at Black Bluff’, Examiner, 13 March 1940, p.4. ‘Gold at Black Bluff’, Advocate, 9 March 1942, p.4. 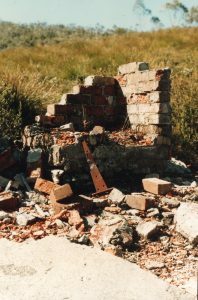 Peter Bell, Devonport Mine near Black Bluff: report to Tasmania Development and Resources, Archaeological Survey Report 1995/03, Historical Research Pty Ltd, Adelaide, 1995, p.2. 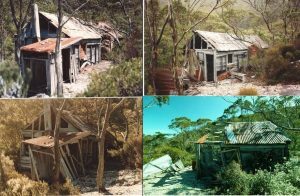 Peter Bell, Devonport Mine near Black Bluff, pp.1–4, 17–18, 24–26. Douglas Stewart Fine Books website, https://douglasstewart.com.au/product/adventures-chunder-loo/, accessed 14 December 2018. Arthur ‘Cutter’ Murray reckoned that thylacines (Tasmanian tigers) followed him when he walked from Magnet to Waratah in the state’s far north-west—out of curiosity, rather than malicious intent. If he swung around suddenly he could catch a glimpse of one. However, Cutter did better than that. In 1925 he caught a tiger alive and took it for a train ride to Hobart. Tigers are just one element of the twentieth-century tale of Cutter and his elder brother Basil Murray. Yet for all their exploits these great high country bushmen started in poverty and rarely glimpsed anything better. Cutter married and produced a family, but his weakness all his working life was gambling: what he made on the possums (and tiger) he lost on the horses. Basil made enough money to keep the taxman guessing but was content to live out his days in a caravan behind Waratah’s Bischoff Hotel. Their ancestry was Irish Roman Catholic. Basil Francis Murray (1893–1971) was born to Emu Bay Railway ganger Edward James (Ted) Murray and Martha Anne Sutton. He was the couple’s ninth child. Arthur Royden Murray (1898–1987?) was the twelfth. Three more kids followed. 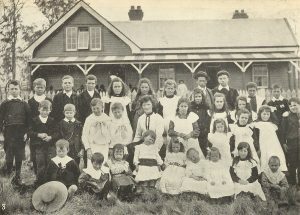 The family lived at the fettlers’ cottages at the Fourteen Mile south of Ridgley while Ted Murray was a ganger, but in 1907 he became a bush farmer at Guildford, renting land from the Van Diemen’s Land Company (VDL Co). Guildford, the junction of the main Emu Bay Railway line to Zeehan and the branch line to Waratah, had a station, licensed bar and state school, but was also a centre for railway workers, VDL Co timber cutters and hunters. Edward Brown, the so-called ‘Squire of Guildford’, dominated local activity. 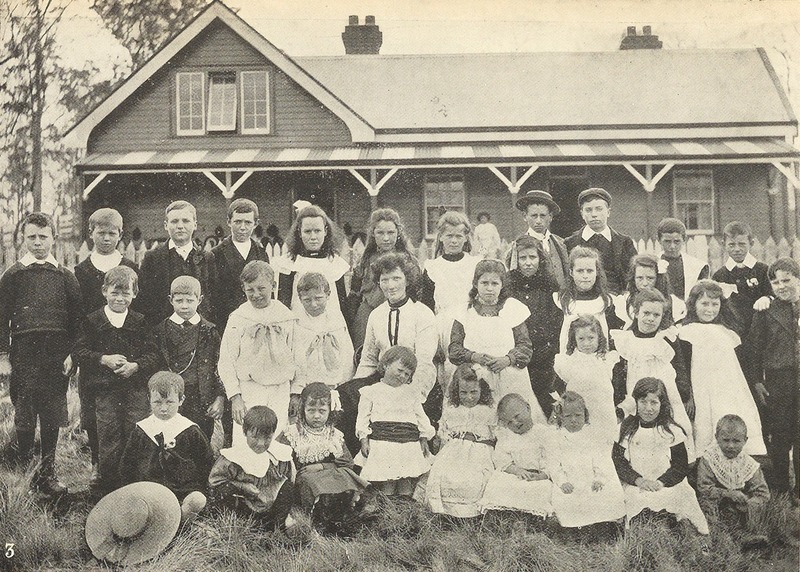 Guildford Junction State School, with teacher May Wells at centre. From the Weekly Courier, 10 November 1906, p.24. Squaring sleepers, splitting timber, hunting, fencing, scrubbing out bush, driving bullocks, herding stock, milking cows and setting snares were essential skills for a young man in this locality. Like others, the Murrays snared adjoining VDL Co land, paying the company a royalty. Several Murray boys escaped Guildford by serving in World War One, but Cutter recalled that his father would not let him enlist. Basil also stayed home. Perhaps it was enough for Ted and Martha Murray that they lost one son, Albert Murray, killed in action in France in 1916. 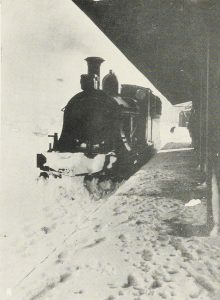 Guildford Railway Station during the ‘great snow’, 1921. Winter photo, Weekly Courier, 18 August 1921, p.17. 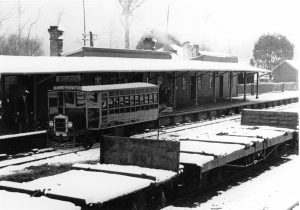 Guildford Station under snow again, 24 September 1930. RE Smith photo, courtesy of the late Charles Smith. Twenty-three-year-old Arthur Murray appears to have married Alice Randall in Waratah during the ‘great snow’ of August 1921. He would already have been a proficient bushman. Cutter learned to use the treadle snare with a springer, although he would also employ a pole snare for brush possum and would shoot ringtails. He shot at night using acetylene light to illuminate the nocturnal ringtails, but he found it easier to go after them by day by poking their nests in the tea-tree scrub. ‘It was like shooting fish in a barrel’, Cutter’s son Barry Murray recalled. ‘It was only shooting as high as the ceiling … A little spar and you just shook it … and they’d come out, generally two, a male and a female …’ Hunters aimed for the nose so as to keep the valuable fur untainted. In the bush Cutter lived so roughly that no one would work with him. Some tried, but none of them lasted. His huts and skin sheds on the Surrey Hills were little more than a few slabs of bark. Friday was bath day, which meant a walk in Williams Creek (east of the old Waratah Cemetery), regardless of weather conditions. Cutter’s son Val once snared Knole Plain with him, but couldn’t keep up. Snares had to be inspected every day, the game removed, and the snares reset. Cutter and Val took snaring runs on opposite sides of the plain, but Val found that even if he ran the whole way and didn’t reset any snares, Cutter would be sitting waiting for him, having long completed his side. 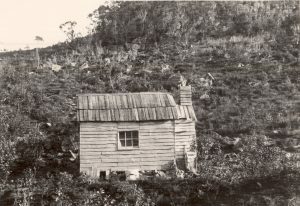 Cutter’s most substantial skin shed was near home base, on the hill above the primary school at Waratah. Here he would smoke the skins before an open fire. He pegged them out both on the wall and on planks about eighteen inches wide, each plank long enough to accommodate three wallaby skins. When the sun shone, he took the laden planks outside; otherwise he sat inside the skin shed with his skins, chain smoking cigarettes in empathy. 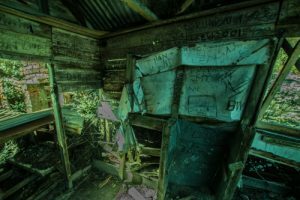 A skin shed had no chimney, the idea being that the smoke would brown the skins as it escaped through the cracks between the planks of the walls. The air was so black with smoke that Cutter was virtually invisible from the doorway. Yet no carcinogens prevented him reaching his eighties. Joe Fagan claimed that Basil Murray was such a good snarer that he once snared Bass Strait. Basil preferred the simple necker snare to the treadle, and caught a tiger in such a device on Murrays Plain, a little plain above the 40 Mile mark on the railway named after Ted Murray. Cutter caught a couple of three-quarters-grown tigers. One was taken dead in a treadle snare with a springer on Goderich Plain when Cutter was hunting with Joe Fagan. Joe kept the skin for years as a rug, but when it grew moth-eaten he tossed it on the fire—oblivious to its rarity or future value. Cutter caught the other thylacine alive in a treadle near Parrawe. He trussed her up and humped her home, where ‘a terrific number of people’ came for a look. ‘They’re very shy animals really, and quite timid’, he recalled of the captive female. ‘It behaved just like a dog and it got very friendly. But when a stranger came near it would squark at them.’ At first he couldn’t get her to eat. The breakthrough came when he skinned a freshly caught wallaby, rolled the carcase up in the skin with the fur on the inside, and fed it to the tiger while it was still warm. In June 1925 ‘Murray bros, Waratah’ advertised a ‘Tasmanian Tiger (female)’ in the ‘For sale’ columns of the Examiner and Mercury newspapers. Hobart’s Beaumaris Zoo offered £30 for it, prompting Cutter to deliver her by train. It was his only visit to Hobart. Four cruisers of the American fleet were in town, and Cutter recalled that ‘it was so crowded you could hardly move. I didn’t like it much’. Cutter tells his story, Mercury, 13 February 1973, p.12. The other big event in Hobart at the time was the Adamsfield osmiridium rush, which ensnared Basil Murray. In the last quarter of 1925 he pocketed £126 from osmiridium, the equivalent of a year’s wage for a farmhand. Later he spent six months mining a tin show alone at the Interview River. Having set the exact date he wanted to be picked up by boat at the Pieman River heads, Basil hauled out a ton of tin ore on his back, bit by bit. On another occasion he worked a little gold show on the Heazlewood River, curling the bark of gum saplings to make a flume in order to bring water to the site. It was pulpwood cutting that gave Arthur Murray his nickname. When Associated Pulp and Paper Mills (APPM) started manufacturing paper at Burnie in 1938, it turned to Jack and Bern Fidler of Burnie company Forest Supplies Pty Ltd for pulpwood. Over the next two decades Joe Fagan supplied about one-third of the pulpwood quota as a sub-contractor to the Fidlers. 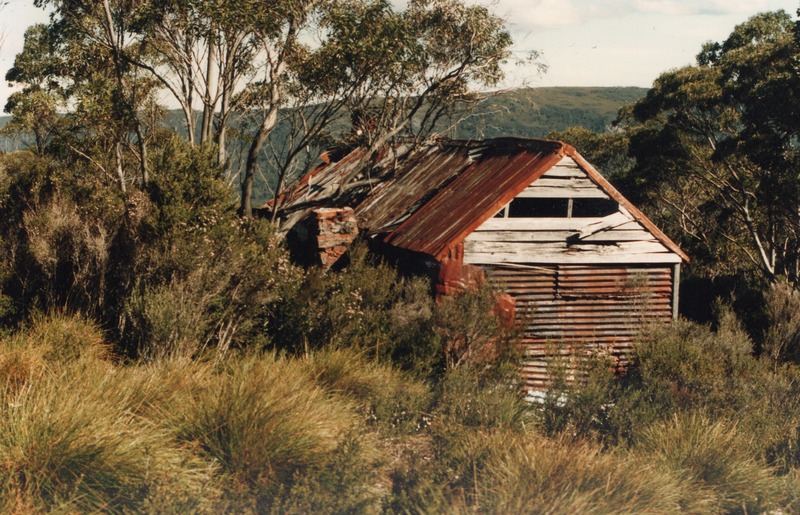 At a time when Mount Bischoff was a marginal provider for a few families, and osmiridium mining had fizzled out, Fagan became a significant employer, with about 65 men splitting barking and carting cordwood to the railway at Guildford for transport to Burnie. ‘I don’t mind the rabbits goin’ through, Arthur, but I bloody well hate those bloody greyhounds behind them goin’ through the holes’. World War Two was a lucrative time for snarers. £15,000-worth of skins were auctioned at the Guildford Railway Station in 1943, while more than 32,000 skins were offered there in the following year. Record prices were paid at what was probably the last annual Guildford sale in 1946. Taking advantage of high demand, the VDL Co dispensed with the royalty payment system and made the letting of runs its sole hunting revenue. One party of three hunters was reported to have presented about three tons of prime skins as its seasonal haul. Both Murrays cashed in. Cutter made £600 one season. Working with Eric Saddington at the Racecourse, Surrey Hills, Basil took 3000 wallabies in 1943. Unfortunately their wallaby snares also landed 42 out-of-season brush possums (21 grey and 21 black)—which landed the pair in court on unlawful possession charges. Both men were fined. Basil had a reputation for being a ‘poacher’, and one story of his cunning, apocryphal or not, rivals those told about fellow poacher Bert Nichols. By the time the Fauna Board rangers got back to Guildford, Basil was still in the bar, propped up against the counter. However, the taxman did better than the Fauna Board rangers. Basil seems to have been a chronic tax avoider. 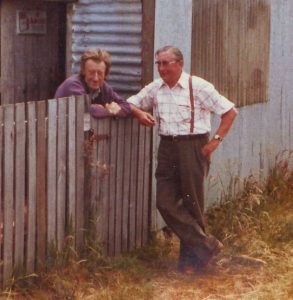 He and Eric Saddington were camped at Bulgobac, squaring sleepers and snaring, when they were busted for not filing tax returns for the years 1941–42–43. Basil kept on in the same vein, landing a £25 fine for not lodging a 1943–44 return and then a whopping £60 for the 1947–48–49 period. Things finally got too hot for Basil, who adjourned to the Victorian goldfields for a time. In 1951 Basil was the cook for the party re-establishing the track between Corinna and Zeehan. One of the track-makers, Basil’s nephew Barry Murray remembered him as ‘a good old cook, as clean as Cutter was rough. They were just opposites. He had a big Huon pine table. He used to scrub it with sandsoap every day, and he would have worn it away if he’d stopped there for two or three years’. Basil became well known as APPM’s gatekeeper at the Hampshire Hills. In 1963 Cutter Murray was one of Joe Fagan’s men recruited by Harry Fraser of Aberfoyle in a party which investigated the old Cleveland tin and tungsten mine and recut the Yellowband Plain track to Mount Lindsay. 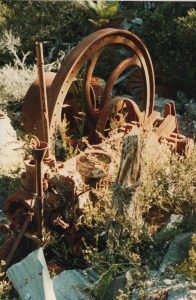 At the party’s Mount Lindsay camp Cutter used snares to reduce the numbers of marauding devils that were tearing through the canvas tents, biting the tops off sauce bottles and biting open tins of beef and jam. Cutter Murray (left) and friend at Waratah. Note the Ascot cigarettes advertisement on the wall behind him. Photo courtesy of Young Joe Fagan. Cutter snared until virtually the day he died in the 1980s, making him—along with Basil Steers—one of the last of the snarers. He possumed on North’s block and took wallabies on the Don Hill, under Mount Bischoff, wheeling the skins home draped over a bicycle. A great snaring dog, a labrador that he had trained to corner but not kill escaped game, made his life easier. Nothing is known to remain of his hunting regime, not a hut or a skin shed. Barely a photo remains of the hardy bushman. His tiger tale flitted across the country via newspaper in 1984, then was forgotten. 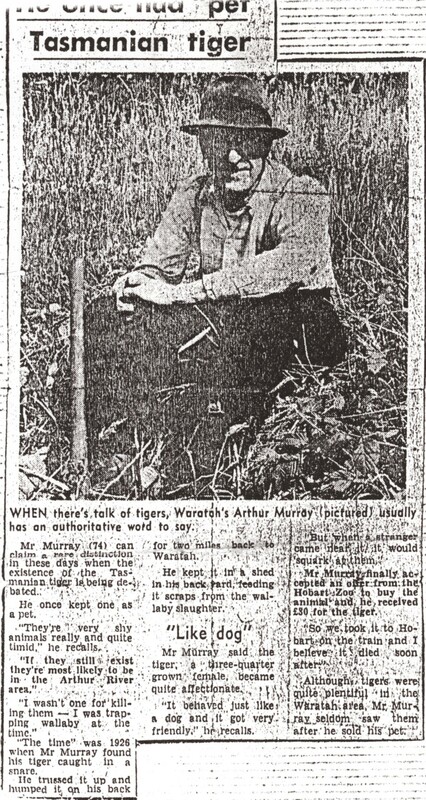 Unfortunately Cutter Murray’s travelling tiger has an equally obscure legacy, apparently dying soon after it was received at the Beaumaris Zoo. Barry Murray, interviewed by Nic Haygarth, 21 November 2008. Barry Murray, interviewed by Nic Haygarth, 23 July 2011. Registration no.484, born 16 May 1898, RGD33/1/85 (TAHO). 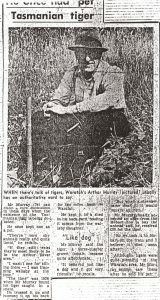 Basil Murray’s years of birth and dirt are recorded on his headstone in the Wivenhoe General Cemetery, Burnie. ‘Ridgley’, North West Post, 8 October 1907, p.2. Cutter Murray; quoted by Mary McNamara, ‘Have Tasmanian tiger, will travel … but only once’, Australian, 1984, publication details unknown. Basil and John Murray were refused an exemption (‘Waratah Exemption Court’, North Western Advocate and the Emu Bay Times, 11 November 1916, p.2; ‘Burnie: in freedom’s cause’, North Western Advocate and the Emu Bay Times, 13 January 1916, p.2), but there is no record of Basil serving. ‘Tasmanian casualties’, North Western Advocate and the Emu Bay Times, 22 September 1916, p.3. Joe Fagan to Bob Brown and Ern Malley, 1972 (QVMAG). Cutter Murray and Joe Fagan to Bob Brown and Ern Malley, 1972 (QVMAG). Harry Reginald Paine, Taking you back down the track … is about Waratah in the early days, the author, Somerset, 1994, pp.62–66. Cutter Murray; quoted in ‘He once had pet Tasmanian tiger’, Mercury, 13 February 1973. AAC (Bert) Mason, No two the same: an autobiographical social and mining history 1914–1992 on the life and times of a mining engineer, Australasian Institute of Mining and Metallurgy, Hawthorn, Vic, 1994, p.571. See, for example, ‘For sale’, Examiner, 17 Jun 1925, p.8. Cutter Murray; quoted by Mary McNamara, ‘Have Tasmanian tiger, will travel … but only once’. Register of osmiridium buyers’ return of purchases, MIN150/1/1 (TAHO). Steve Scott, quoted by Tess Lawrence, A whitebait and a bloody scone: an anecdotal history of APPM, Jezebel Press, Melbourne, 1986, p.25. Kerry Pink, ‘His heart belongs to Waratah … Joe Fagan’, Advocate, 10 August 1985, p.6. ‘Trappers fined’, Advocate, 22 October 1943, p.4. For Nichols’ poaching, see Simon Cubit and Nic Haygarth, Mountain men: stories from the Tasmanian high country, Forty South Publishing, Hobart, 2015, pp.116–19. Ted Crisp; quoted by Tess Lawrence, A whitebait and a bloody scone: an anecdotal history of APPM, p.26. ‘Men fined’, Mercury, 5 May 1944, p.6. ‘Fines imposed for income tax offences’, Mercury, 5 September 1946, p.10; ‘Fined for tax breaches’, Examiner, 6 July 1950, p.3. AAC (Bert) Mason, No two the same, pp.570–71, 577, 579. Email from Dr Stephen Sleightholme 26 December 2018; Cutter Murray stated his belief that it died soon after arrival in Hobart in ‘He once had pet Tasmanian tiger’. I thank Stephen Sleightholme and Gareth Linnard for their contributions to this story.